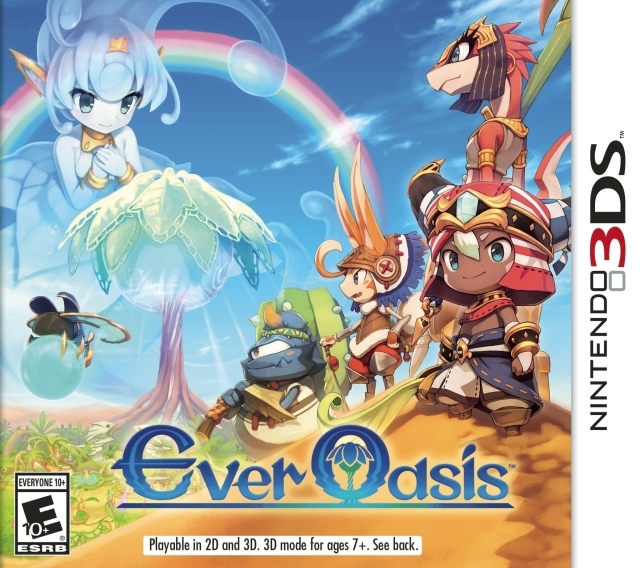 Announced back at Nintendo’s E3 2016 Direct, Ever Oasis came onto the scene as a new by Grezzo, the same developers behind the remakes of The Legend of Zelda Ocarina of Time and Majora’s Mask. It also just so happened that the CEO of Grezzo, Koichi Ishii was also the creator of the Mana series or Seiken Densetsu as its known in Japan. The early entries, primarily Secret of Mana and Seiken Densetsu 3 are regarded as some of the best games on the SNES and for good reason. So when it came time for a successor, it was apparent from its announcement trailer that the new game would borrow heavily on Koichi’s past works with both the Mana series and newer works of The Legend of Zelda. After my playthrough, I can say they were prevalent with some other smaller examples thrown in the mix, but is the game greater than the sum of its parts? The game begins with the main protagonist, who you can customize by naming and picking their gender and appearance, beginning a new day with his or her older sibling getting ready for annual the festival for his growing Oasis. Tragedy strikes, however, and the seedling’s, the species of the protagonist, old nemesis Chaos has infiltrated the Oasis and spread its corruption to the point of no use. Chaos wins the struggle and in a last ditch effort the older sibling sends the protagonist off to one of the last known available water spirits. Your task is to make your own Oasis and thrive and hopefully beat Chaos. It’s here the protagonist meets the water spirit Esna, where your adventure begins. When I say the game is more old school in its approach I really do mean old school, as in the game’s plot is extremely thin. The main antagonist is a natural evil force whose motivation is to spread and destroy as the name implies. The characters have little to no depth outside of their introduction and side quests, with a little banter on the side but that’s all you’re gonna get. The main character and Esna have sit-down chats as you progress and level up your Oasis. While it is something its nothing substantial, and neither are the few plot twists the game throws at you with the story taking a backseat to the gameplay. The gameplay can also be seen to have many similarities to its peers like Fantasy Life, Rune Factory and even a sim game like Animal Crossing; it’s a blended mixture of action-oriented RPG mechanics laced with town building sim elements and resource gathering for crafting with dungeon crawling thrown in. The game’s combat is fast and always moving with quick and strong attacks strung together to make combos. Your special attacks fill your gauge facing off against the variety of enemies, and all the while you are leveling up to increase your stats and gain new combos. Expanding and building up your Oasis requires you to accommodate visitors called Noots who purchase goods from the various stores you construct from the seedlings which settle into your little city after completing tasks. Some of these settlers are more for combat purposes and every one of them can be invited along for the ride to explore the vast world and its many dungeons. They will fight alongside you, complete puzzles and collect items with their unique special abilities, and they also level up. Both combat and simulation aspects are tied together by exploring the world for items and monster drops to keep all the shops stocked up and the shopkeepers happy. While it sounds annoying, its benefits are massive as the more you keep them all happy at a given time, the bigger the extended health bar you have when you leave your Oasis, which increases your party’s durability. As you keep expanding, so does word of your Oasis, which means even more, NPCs want to move in. As time passes and you keep stocking up your stores, their happiness gauge goes up, which introduces new tasks. When completed, the shop levels up with new items in stock for more money opportunities and your extended health bar increases even further. More money means more building opportunities and more resources to craft equipment and health items to further strengthen your character. After you hit a point, you can level up your Oasis which clears up more of the landscape for room to build and more potential settlers. To collect your earnings you need to use your wind abilities on the buildings themselves. However, at times you need to sleep at your house to make all of the prompts to collect them to appear. I found this an odd design choice as you can only advance time during the night, making you have to potentially wait it out which is a bummer, as their are even time related quests during the day, afternoon and night. Some NPCs will have to be found, usually from a rumor given to you by other NPCs. As you progress through the story, Chaos will rear its ugly head and attack your Oasis, which means you have to use your Wind ability to clear it up and go out and complete a dungeon to defeat the boss inside. Once you do and collect the orb inside, you will power up your wind ability, which is necessary to combat and eventually defeat Chaos. While the combat system works fine I never needed to use most of the combos attained from leveling. Simply using a string of quick weak attacks while dodging as enemies charged did the job just fine, and that includes the bosses. Enemies have their own weaknesses to certain weapons which encourages you to plan for your adventure regarding who is best to bring with you. I was impressed how capable your team AI is, with it only being dumb enough to roll into attacks a few times. As long as you keep up collecting items in the overworld and harvest your plants often you will never really have any issue with missing ingredients to craft with. Clothing only serves a cosmetic purpose and healing items are plentiful. Being that the the game being on the easy side, I never had to use them often anyways. While warping, the game informs the player which abilities/weapons would be recommend for the location/dungeon before proceeding, which was quite convenient. Though, you only can have two party members at a given time, it gets very repetitive having to warp back and forth from town to just switch out party members that have the necessary skill to solve that one puzzle or get that one harvest spot. Thanks to the game including such a helpful warp system, I never felt tense even when things got bad, as I could just wisp away with a mere touch of a button, making the harder random encounters on the fields later on feel less engaging and exciting.